Welcome Home Blog: THE AMAZING OSTER ROASTER! First of all, I want to let you know that I do not get paid by these big manufacturers when I post something about a product like this one I'm about to tell you about. If I like something a lot...I enjoy sharing it with you. Simple as that. And I like this one so much that I just have to tell you about it. Last year I wanted to roast my turkey the old fashioned way using my Mom's old traditional recipe that I grew up knowing so well. The kind of turkey that you roast slowly in the oven and baste in it's own juices. The problem was I needed my oven for all the other dishes I was making. How could I possibly bake my mac and cheese, sweet potato casserole, roasted Brussel Sprouts, and all those other dishes with a big bird in my oven all day? I found myself wishing I had another oven instead of the one that came with my stove. Don't get me wrong, I have a big oven in the LG range and even a small oven at the bottom. But I was wishing I had another separate oven to make my Hams and Roast Beef and Crown Pork Roast and especially my Turkey every year. I certainly didn't have room to add another oven to the kitchen, nor the money. So I set out to find a solution. And I found one! And I love it! And I was so impressed by it that I want to share it with you! I am in awe of this thing and it cost me less than $50! And it freed up my entire oven for the day. 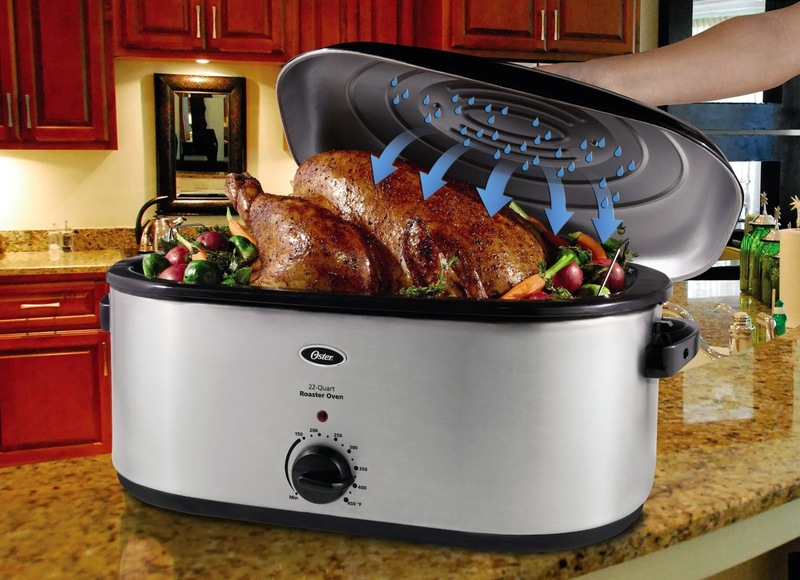 It's called the Oster 22-Qt Roaster Oven and it will roasts up to a 26-lb Turkey. It is really pretty too.... with it's clean and shiny stainless steel finish. 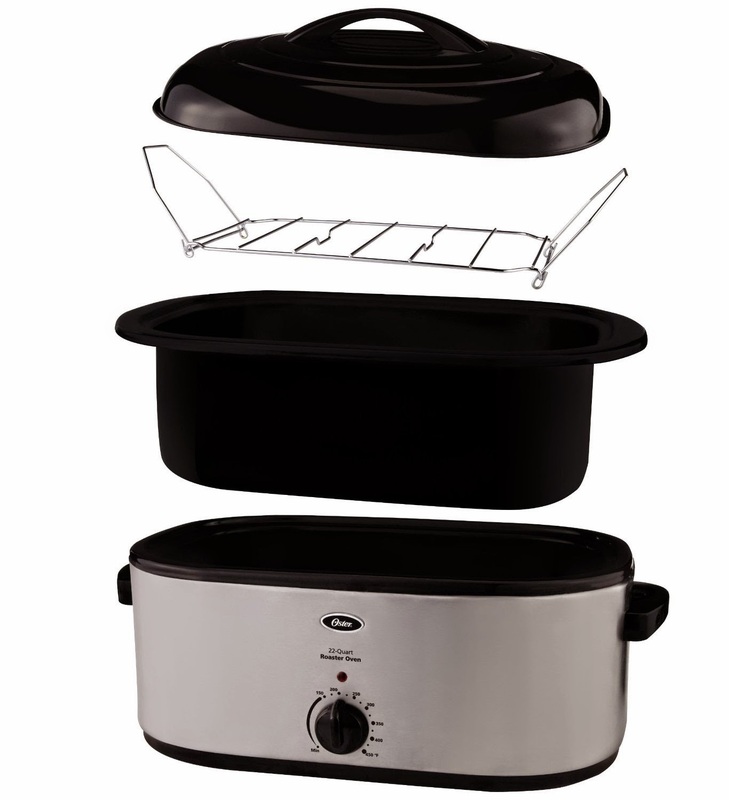 It has a removable enamel-on-steel roasting pan for fast, even heat distribution and easy clean-up; plus a steel roasting rack to raise your turkey above the juices. I love this thing! First, I set it for 450 degrees to get it really hot. Then I put the turkey down in this deep roaster and covered it with the lid. After about 15 minutes I turned it down to 350, anticipating that my 16 pound turkey would get done in the 3 1/2 hours it said on the Butterball label. I set it and then I just walked away to prepare my Thanksgiving meal. I didn't even have to baste it because it has a self basting lid! After about 2 hours I just had to look under that lid to see how things were going. I opened the lid and just stared in amazement! I was so shocked at what I saw that I was speechless. There was the most beautiful golden brown picture perfect turkey I had ever seen in my life! How did that happen? 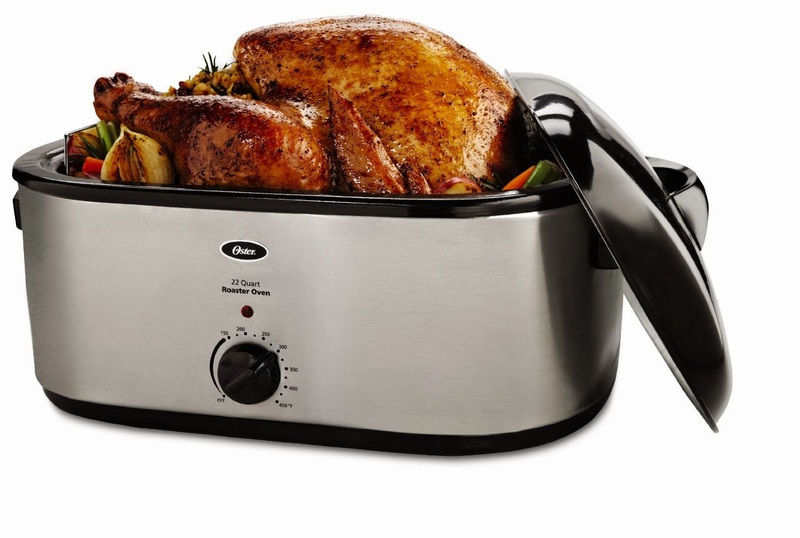 How did this turkey get so beautiful in an electric roaster? I still have no idea! I decided to take it's temperature, even though according to Butterball my turkey would need 3 1/2 hours to cook. I inserted the probe from my reliable instant read thermometer from ThermoWorks into the thickest part of the breast and it showed my turkey was perfectly cooked at 165 degrees! How could that be? This big beautifully browned 16 pound turkey had cooked in only 2 hours! So, I turned the dial to "Keep Warm" and the roaster then became a slow cooker. By the time my dinner was ready 90 minutes later, I had a turkey unlike any that I had ever cooked before. It was fall off the bone tender. It was so easy to carve. And the turkey was so moist you couldn't believe it. I now know that as a self-contained roaster, it uses the steam from cooking to lock in juices. The self basting lid and the steam browns the skin as if you roasted in a hot oven. All I can say....and with no reservations.... this was the best turkey I have ever made in my life! And my guests could not get over how good it was. I can say that this Oster Turkey Roaster is way up on the list of one of the best investments I have ever made. Get yours on sale today at Amazon with the Welcome Home code....just in time for your next holiday meal. I plan to make my Christmas Ham and Prime Rib Roast in this for Christmas! Order it with the embedded Welcome Home code in the following link and not only will you get the sale price, you will be helping me save the lives of dogs and cats who are killed in shelters while waiting for a new home.